Second was the computer. For a few weeks now my Mom has been telling me how good Brayden is becoming on the computer (not just the Ipad, an actual desktop computer) I let myself get so busy with the day to day that I never had the time to see this for myself..until this week that is. He asked to play on the computer so we went upstairs and put in JumpStart Toddler - learning software I bought for him last year. The last time we played this it was Brayden sitting on my lap and I would manuver the mouse around and he would point and laugh. Not anymore....now Brayden sits by himself in the chair and uses the mouse all by himself and knows exactly what he is doing and where to go. I was literally AMAZED watching this. He was so proud to show me his skills and I was just as proud to watch. I sat and watched him play for a little then it was time for bed. The next night he asked again to play on the computer and I still had to feed Ella and do some other things so I decided to let him play in the office by himself. 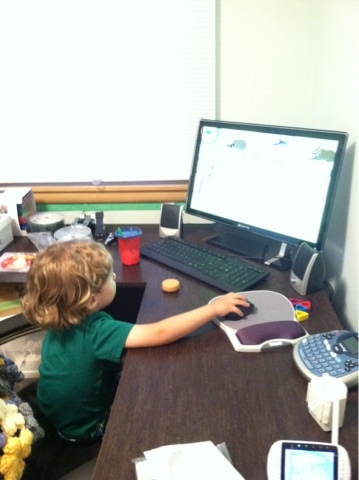 I set him up and went back downstairs and thought to myself, "How in the world do I have a child old enough to sit and play on a computer by himself??" Again, this made me a little sad but I am also so happy with the little man he is becoming. Every 10-15 minutes Brayden would call for me to show me what he was doing, he just loves playing on that computer! In addition to JumpStart Toddler, I also bought him Disney Fun Skills and he absolutely loves this one as well. - It's true what they say, it's amazing watching life through your child's eyes! Ella Grace - 9 Months!